The new work of Peter Williams is in response to the recent and not so recent spate of attacks, killings, and murder of Black people by police across this country. "Common & Proper Nouns: The N–Word" is a small body of painted works on canvas. The genesis of a super hero is at the center of this group of works; Police are transformed into pigs and beasts of all kind. The N-Word is the super hero and is open to discussion as to the truths and meanings of the N-Word, which for the sake of the body of work I classify as a Noun. I had overheard someone say, “ He use’s the N-Word as if it were a proper noun”. Who are we and for that matter who are they? Peter Williams was interviewed by Scott Indrisek about his show for ArtInfo. Check it out! 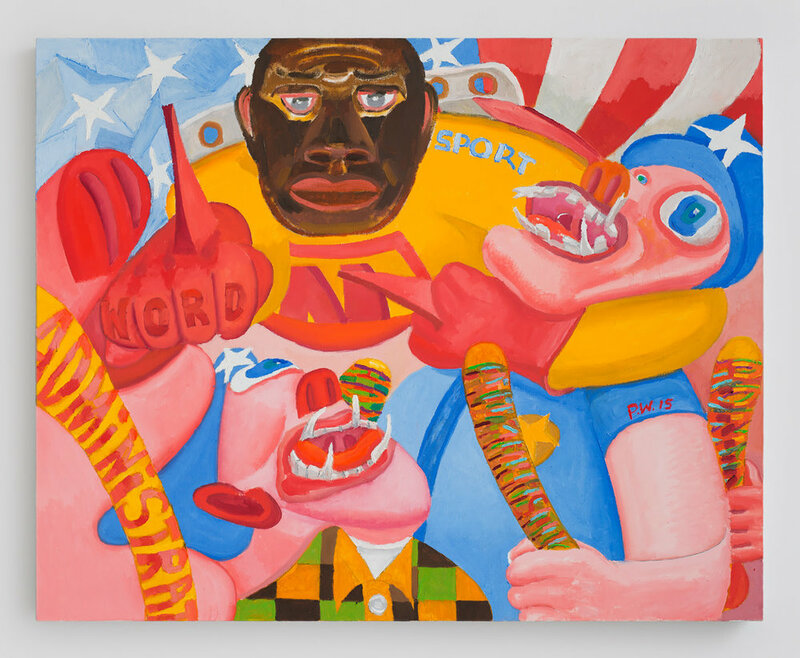 The 2014 deaths of Michael Brown and Eric Garner at the hands of police — to name but two of the highest-profile such incidents in that, or any, year — catalyzed a series of in-your-face, unapologetically brash paintings that Peter Williams finished in a concerted burst last winter, on view at New York’s Novella Gallery through April 5. Subtle it is not: Cops are depicted as literal pigs, or occasionally Cyclopian freaks; one of these porcine villains mounts the expiring body of Eric Garner, his “I can’t breath” mantra spilling out of his mouth and down the canvas. The narrative portrayed in these paintings marries headline events with a comic-book fantasia that owes something to Trenton Doyle Hancock — Williams’s myriad abusers-of-power are countered by an African-American superman known as the N-Word. (At times, the brightly colored, grotesque-leaning crowd scenes also recall a pared-down James Ensor.) I spoke with the Delaware-based artist about bearing witness to injustice. This works seems like a new direction for you. I’ve made work in the past that dealt with politics, or African-American history and points of view. Back in the ’90s, during a similar series of events where young black men were being killed for going in the wrong neighborhoods, I did pieces about perpetrators of hate crimes. When I lived in New Mexico I did work on black cowboys. My work has always been charged by a kind of — not Afrocentricity, but an awareness of the presence of blackness and its meaning in the contemporary world. But this is perhaps the most profound body of work inasmuch as I really concentrated on a group of paintings that were about a specific series of incidents that have happened over the last year that have helped inform me about the growing murder and assassination of African-American men and women due to police naivety or ignorance. I don’t think it’s all the police, I think it’s that certain people in the departments have given themselves permission to literally execute these young people. I was outraged, and over winter break I worked on this small body of work, 10 pieces. I felt compelled to put it out there. Even though these paintings deal with real world events, they have a fantastical element to them. I made one painting and it led to another, and another, and graphically I realized I wanted the paintings to address a stripping down of the surface, involving more of the fundamentals of construction of the painting. I’m not an activist, per se. I do think my work deals with trying to make people consciously aware. And to bear witness to the events that happen in our time. I have to be honest, I personally often go back and forth regarding my thoughts on the relationship between art and politics, and whether art is an effective vehicle for putting forth political viewpoints. But I was moved by your show and very shaken up by it. Does the work that you admire or that inspires you generally mingle art and politics? Pretty much. Traveling and having the experience of seeing art in the country that it was made in, that has helped me to understand that it’s important to bear witness of the time in which you live. I always felt that term, to bear witness, was an inherently black kind of statement, coming out of the ’50s and ’60s, the political struggle. I’m not making art just for art’s sake. At moments when something has really gotten me and compelled me such as the recent events have, I’ve tended to focus in on them. I tried not to make beautiful paintings. I wanted them to be flat, poster-like, immediate, like they were done on the spot. As if they were in place of the videos that are being made these days by the public. There’s a coarseness about the work. The narrative does make it almost a battle between good and evil. Well, it’s not a clear subject. There are black cops as well as white cops. There are black cops who perpetrate some of these crimes. I didn’t want it to be a white against black thing, I wanted to show a lot of culpability on many sides. But primarily, I see that culpability within the dominant culture. Did you have any anxiety about showing these works, especially after the murder of the two NYPD officers back in December? I didn’t have any anxiety. I own the work, I own the ideas in the work, I felt I had a responsibility. The fact that New York is going through moments where there’s a criticality because somebody turned on the cops and shot them — that’s one incident out of many hundreds of incidents that we see across the country. That story was complicated by the fact that the guy was mentally ill. It would be different if all these cops were mentally ill.
Rather than one being an institutional problem and the other an outlier. Right. I think there’s going to be a lot of pressures put on the white communities as well as minority communities to find a solution to the kind of anger that’s being manifest. We’ve given the police military trucks, we’ve militarized them. We’ve created a mindset in this country, an outlet for this insanity or racism to manifest itself, that you can have almost rogue cops pull up on a 12-year-old boy and shoot him to death before he knows they’re the police. It’s a representation of the way the black body has been seen as less than human. At some particular point I think things could get so out of control that the militarization of the police is going to affect everybody regardless of race, class, or gender. In some ways it already has. There’s one painting in the show on the back wall that really stands out. It’s a simple portrait of an African-American police officer. He came at the very end. I was looking at the assembled body of work, and it dawned on me: What must the African-American cop be going through who witnesses these kinds of activities, and has to still go to work? What role does he play? It’s not simply that we’re all victims. Some of us are victimizers. I saw that when I was in Detroit — African-American police sometimes would victimize the public. Even as an African-American I had my doubts about some of the accusations that were going on. But when I not only saw the video tapes, but that these cops were getting off, it just blew my mind. I’ve got to be somewhat blatant in my role and responsibility. I want to make work that speaks to me, speaks to my heart, speaks to the kind of things I feel responsible for.